Top with cheddar. 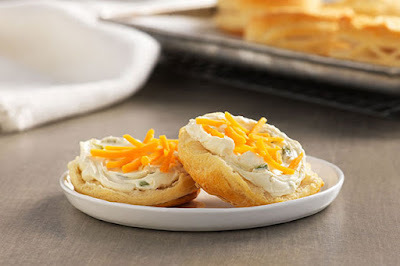 Split biscuits in half; spread with cream cheese spread. This veggie egg bake gets its cheesy deliciousness three ways: with pepper Jack, cream cheese and Parmesan. It's a guaranteed winner with the brunch crowd. 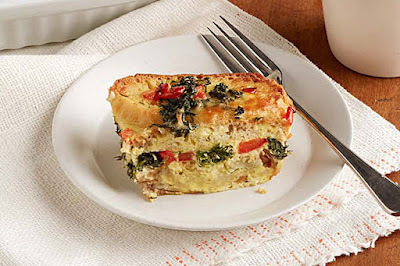 Layer half each of the ciabatta slices, spinach, peppers and shredded cheese in 13x9-inch baking dish sprayed with cooking spray; repeat layers. Microwave cream cheese in large microwaveable bowl on HIGH 30 to 40 sec. or until softened; whisk until creamy. Gradually add milk, about 1/4 cup at a time, whisking after each addition until blended. Whisk in eggs and Parmesan. Pour over ingredients in baking dish; cover with foil. Refrigerate overnight. Heat oven to 350ºF. Bake casserole (covered) 45 to 50 min. or until knife inserted in center comes out clean, uncovering after 30 min. Remove from oven. Let stand 10 min. before serving.